An easy, quick, and satisfying meal, this penne with chicken, broccoli, and sundried tomatoes dish, with it’s fairly light yet garlicky, creamy (no cream!) sauce, is a welcome meal on any night of the week! 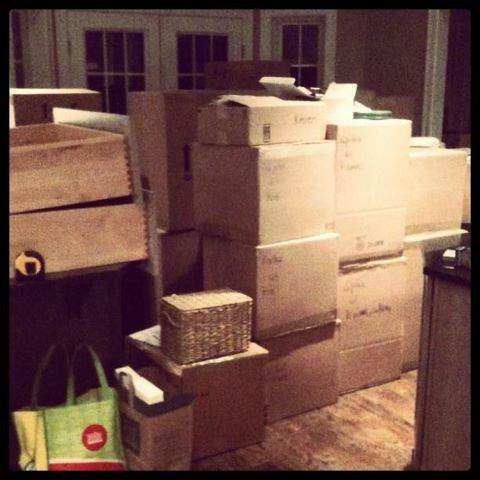 It has been one heck of a week for us here – we finally moved into our new home this weekend! Of course, with that it almost requires a stint in light combat training in order to walk through the kitchen and I’m not sure if I’ll ever find my pots and pans…which hopefully means that there is set of stainless steel beauties in my near future. But no matter, the boxes will eventually get emptied, the mounds of packing paper will make their way to the dumpster in our front yard (I’ll bet our neighbors love that), I’ll find a place for the kitchen table, and maybe I’ll even be able to cook dinner when my parents come to visit this weekend. 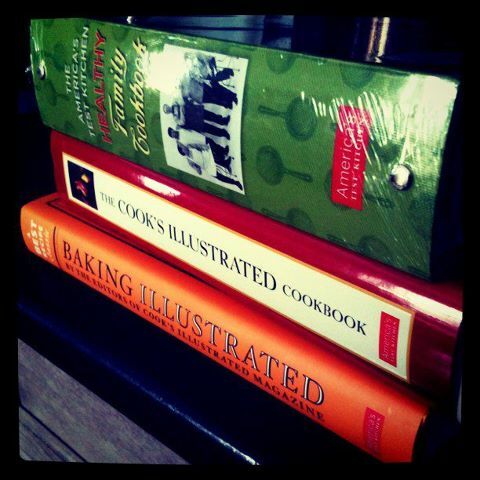 Speaking of cooking, let me mention the first new purchases for the kitchen and how much I already adore them. I’ve made it a point to make these books staples in this new kitchen (I promise that pics are coming once I get it cleaned and organized!) and after having made a few recipes from Baking Illustrated, chicken pot pie with savory crumble topping from The Cook’s Illustrated Cookbook, and these baked panko chicken fingers from the ATK Healthy Family Cookbook, I know this won’t be an issue. This penne with chicken, broccoli, and sundried tomato recipe hails from the Healthy Family Cookbook and it’s a definite keeper. With the anticipation of packers and movers invading our old house last week before the move, I made this dish to make sure we had a decent homemade meal for a few nights that only needed to be reheated in the microwave. And in fact, it was more that just decent. 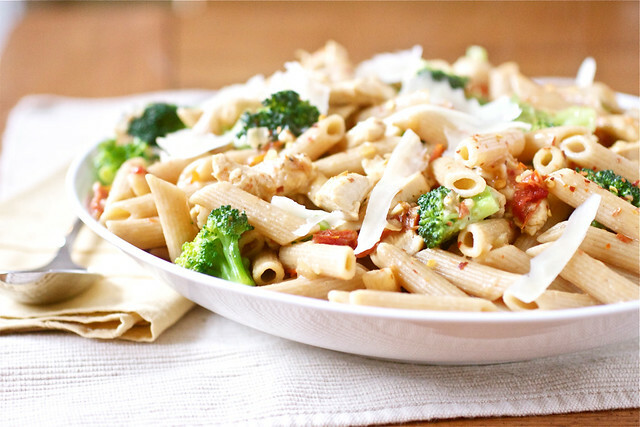 With whole wheat penne, a ton of fresh garlic, quickly sautéed sliced chicken breasts, bright green broccoli, and a full half cup of sundried tomatoes, this meal packs a punch without a whole lot of fat or calories. A creamy sauce is created with just some white wine, chicken broth, and pasta water and it coats the pasta beautifully. We both loved this meal so much that we may have argued over the last of the leftovers. It’s not a big deal though since it was so easy to throw together that I imagine we’ll be having it again soon. Once I find those darn pots and pans. Heat 1 ½ tsp of the oil in a 12-inch skillet over high heat until just smoking. Add the chicken and cook until lightly browned but not fully cooked, about 2-3 minutes. Transfer to a bowl. Lower the heat to medium and add the remaining 1 ½ tsp of the oil to the skillet. When the oil is shimmering, add the onion and cook until softened, about 5 minutes. Stir in the sundried tomatoes, garlic, anchovy paste, and red pepper flakes; cook until fragrant, about 30 seconds. Stir in the flour and cook for 1 minute. Slowly whisk in the broth and wine and bring to a simmer, scraping up the bits from the bottom of the pan. Cook, stirring occasionally until the sauce has thickened, about 15 minutes. While the sauce thickens, bring 4 quarts of water to a boil; add the broccoli and 1 tbsp Kosher salt. Cook, stirring often until the broccoli is crisp-tender, about 2-3 minutes. Using a slotted spoon, transfer the broccoli to a paper towel-lined plate to drain. Cook the pasta in the same water according to package directions. Reserve ½ cup of the pasta water before draining. Once the sauce has thickened, return the chicken and any juices to the skillet. Simmer until the chicken is cooked through, about 2 minutes. Off the heat, stir in the Asiago and season with salt and pepper. Return the drained pasta to its pot and transfer the chicken mixture, broccoli, and basil to the pot; toss to combine. If the sauce is too thick, stir in some of the reserved pasta water until it reaches a desired consistency. Sprinkle some additional red pepper flakes over the top of the pasta before serving, if desired. Serve hot. Congrats on the move! This dish looks comforting and delicious! This looks really delicious! I’ve been thinking of getting a Cook’s Illustrated cookbook because I always hear rave reviews about their recipes. Maybe I should make an investment some time soon. This looks delicious! Congratulations on the move! Hopefully you’re settling in ok, I hate moving so I know how that goes! I love this pasta dish, great flavors! This is one of my favorite recipes from ATK”s Healthy Family Cookbook. It has a permanent spot in our meal rotation. Everyone loves it, and it is super easy to put together. Just thinking about it has my mouth watering! LOVE this pasta. Printed the recipe and made it a few weeks ago… and misplaced the recipe! Was so glad I remembered to come back here and do a quick search. Can’t wait to make it again… Tonight! !